Page 3 quickly explains what the players need to know about the system, rules, and expectations of play. This game is not for the passive nor loners, nor does the challenges scale to your character level. In actual play, your character should be motivated to act, and to act as part of a group. The game does not deal well with hostile loners, apathetic brooders, or other characters that have to be coaxed into engaging with the world and cooperating with the rest of the group. The world of Stars without Number is dangerous, and characters who cringe from peril or insist on facing it alone will find only boredom or an early grave. For everyone interested in playing Stars without Number, read this page! I love this section: a detailed procedure for how you make a character, step by step, as well as a visual map of the steps as they apply to the character sheet. I love rolling for stats, and 3d6 straight down in order (with a stat tweak) is the oldest of school. And we use the old standard abilities (Str, Dex, Con, Int, Wis, Cha). Nice. I’m not much of a fan of the 3.X+ era of stat modifiers; I find they bring tremendous bloat to all numbers (HP, AC, Skill Modifiers), and strain the underlying system far more. A deviation from B/X D&D, because there are actual skills. And instead of using a 1d20 for skill resolution you use 2d6. So 2d6 + skill rank + ability modifier. This formula does not apply to combat (which instead uses the venerable d20 mechanism). By using 2d6 we get a bell curve, and a somewhat less swingy skill resolution system - and that feels right to me. The skill-level table describes the relevant competency: level-0 trained with basic competence to level-4 superlative expert. It initially felt a bit odd that when you get your first rank in a skill you open at +0. Untrained you have a -1. There are underlying system reasons that become self-evident as you look at the whole, but for now lets just make note of this proud nail. Then comes the skill list, 19 non-psionic skills and 6 psionic skills, all highlighting how you interact with the world and game. Find people who can be helpful to your purposes and get them to cooperate with you. Roll it to make useful connections with others, find people you know, know where to get illicit goods and services, and be familiar with foreign cultures and languages. You can use it in place of Talk for persuading people you find via this skill. It sits in a similar spot as Burning Wheel’s Circles, and provides crucial tooling to play in the sandbox; This skill gives you the player agency to bring forth NPCs that you need to advance your goals. Yes and more yes! I love random backgrounds (see my 5th Edition Character Funnel rules). And the rules are clear, you can choose from or roll on the table. roll 3 times amongst the Learning and Growth sub-tables. I love this, you can build out the character you want, or you can let the dice guide you towards your character. Take a look at the Barbarian example below. Each class feels unique, yet broad in its application. I can see each of the backgrounds choosing each of the classes. Everyone gets to pick a Focus, while warriors and experts get a bonus. Each Foci has two ranks, each providing a substantive perk. These Foci break (or expand) the rules for your character’s skills. There are several combat oriented foci, as well as non-combat oriented foci. All allowing for a greater character refinement. The concept of Foci is new to the revised edition of Stars without Number, and is a welcome add. Below is the Connected focus, which I love. You’re remarkably gifted at making friends and forging ties with the people around you. Wherever you go, you always seem to know somebody useful to your ends. Level 1: Gain Connect as a bonus skill. If you’ve spent at least a week in a not-entirely-hostile location, you’ll have built a web of contacts willing to do favors for you that are no more than mildly illegal. You can call on one favor per game day and the GM decides how far they’ll go for you. This is your last chance to grab a skill you want (non-psychic), or improve a rank-0 skill. You get one skill (your choice). Then roll those hit points. It’s 1d6 plus your Constitution modifier (minimum of 1 HP). As a warrior you get an additional 2 more hit points. And set your base attack bonus and saving throws. Physical saves are 15 minus the better of your Con or Str modifier; Mental saves are 15 minus the better of your Wis or Cha modifier; Evasion saves are 15 minus the better of your Dex or Int modifier (harkening back to 4E D&D). And last choose an equipment package or roll your starting credits (2d6x100) and go on a shopping spree. An assortment of equipment packages, along with quick instructions for your attack bonus and armor class. Plenty of flavor wrapped into each of these packages. Want something faster than the already quick character creation, you can roll for a random class and style (e.g. Expert[Smart]), background and associated skills, relevant foci, and your bonus skill. Not to bad to whip up something in an extreme hurry. Character creation provides a path for players to choose what they want or to cast their lot to the wind and draw forth a character concept from the ether. I like that flexibility, as often times the most interesting characters I’ve played were ones that came about through the constraints of randomness. 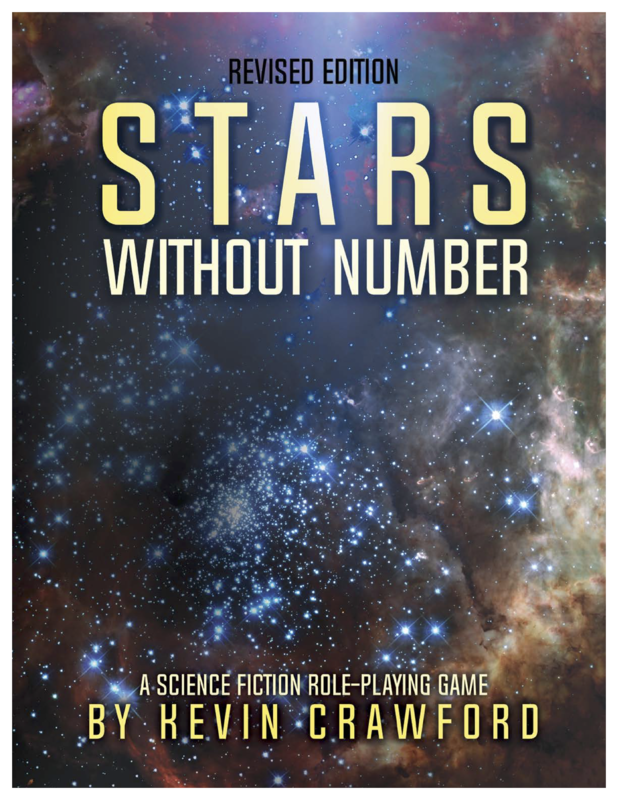 Let's Read “Stars Without Number” - Character Creation by Jeremy Friesen is licensed under a Creative Commons Attribution-NonCommercial-NoDerivatives 4.0 International License. Based on a work at https://takeonrules.com/2018/07/09/lets-read-stars-without-number-character-creation/. Permissions beyond the scope of this license may be available at https://takeonrules.com/more_permissions/.